In a large pot bring 2 litres of water to a boil and add salt, sugar, peppercorns and allspice. Boil the mixture until the salt and sugar have dissolved. Once dissolved, turn off heat and set aside to cool completely. Once the brine mixture has cooled, pour into the cooler with rosemary, thyme, cinnamon and bay leaves. Next, place the turkey into the cooler and fill with enough cold water to cover. Add ice to ensure the turkey remains cold. Place the lid on the cooler and store in a cool place overnight. Brine for 10-12 hours. Preheat the oven to 375F. 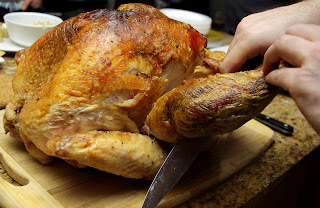 Remove the turkey from the brine, rinse with cold water, and pat dry. Place the turkey, unstuffed, on rack in a roasting pan and add a couple sprigs of Rosemary and a few sliced clementines into the turkey cavity. Insert digital thermometer into the deepest part of the thigh, without touching the bone. Roast turkey until it reaches an internal temperature of 161F. (Note: Be sure to set themometer to 161 F, not Celsius...setting to 161C may will result in a carbon encrusted turkey!). Once turkey is done, cover with foil and a thick tea towel and let rest for 30 minutes. Carve and enjoy! 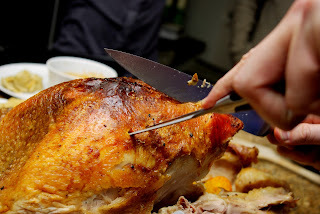 Here are some tips on how to Carve a Turkey.